It starts with knowing WHY you want the speaker. The specific requirements of your event and your audience at your function all add up to something unique. From a keynote presentation intended to energise and provoke ideas at a conference, to seminars teaching your sales staff the principles of goal setting and motivation, to entertaining clients at a Christmas function – In every case, you want a motivational speaker because you want results. After listening to a motivational speaker you want the audience to come away with a new understanding and a different attitude – to think differently and act differently. You want them to enjoy themselves too! ﻿So before any presentation I will always meet with you to understand the background and goals of the occasion, the size and demographics of the audience, and what content needs to be put across in what manner so that my presentation and delivery can be specifically crafted to meet your needs, and you get maximum value from having me. To help give you a better idea of what I present on, see the box below. Of course the content of these speeches can be mixed and matched or new content created for your specific situation. Email me or phone me to have a chat, or get some ideas from below. This workshop will get your participants to identify unhelpful beliefs and behaviours and replace them with empowering new attitudes and techniques. If you are looking to embed a culture of high performance in your business. If you are about to set an audacious task to your team, or if you have already set that task and progress is poorer than expected than this workshop is what you need. Is your team under pressure to deliver major results? Are they daunted by the size of the challenge they have been asked to take on? Few things stay the same in business. Competitors get faster and smarter. Consumers want more for less. To take your organisation to the next level of performance will often require setting and achieving audacious commercial goals – be it dramatically raised sales targets or rapidly developing new products. However, when a team is handed a challenge that requires them to step out of their comfort zone, they may not always react with delight. If they are not fully engaged their efforts may only be half-hearted, leading to a lack of progress and a self-perpetuating cycle of discouragement. Energy that could be spent on making headway is instead siphoned off into making excuses and justifying poor performance rather than taking personal responsibility for the things that can be changed. This presentation confronts those unspoken doubts head-on, and provides tips, tools and realistic strategies to help refocus team members on what they can control. It helps them build resilience, create momentum and achieve success. I have a lot of sympathy for teams taking on a big challenge – when I was considering taking part in the trans-Atlantic rowing race, or trekking to the South Pole I was mesmerised by how this was very likely to lead to a lot of painful suffering and then death. The brain is very good at coming up with sensible reasons why it might be wiser to take on other objectives – particularly when you don’t have any rowing background and are prone to seasickness. The very first step was dealing with the perception of risk, and I share a very powerful insight that was pivotal on setting me back on track, correcting my attitude. Then there is the distance. If you’ve flown across an ocean and looked out of the window you may have remarked at how much water there is in the world. If it seems like a lot when you are at 30,000 feet and travelling at 700 miles an hour, then you can imagine what it feels like when you are down on the water going 3 miles an hour. You spend all day rowing towards the horizon and what do you find when you get there? ﻿Under these circumstances it is extremely easy to feel overwhelmed, and perversely it becomes very difficult to make yourself do what is required to make progress. I share the three techniques that allowed me to break this cycle and continue persevering at maximum effort. I focus on the questions and objections that take place during the various stages of a challenging project that if left unanswered will cripple motivation. • Why do we need to do this? • What about the risks? • But I don’t know how! • How committed do I need to be? • We’re not making any progress! • Is it going to be worth it? With each question I provide a technique, or a new belief that will assist team members to achieve more than they thought possible without sacrificing their sense of humour or sanity along the way! "We have had numerous motivational speakers over the years. None have had the resounding impact that Kevin had. The quantity of unsolicited feedback from our employees clearly indicated the excellence of Kevin's presentation. Kevin inspired the team by showing an every day person can achieve outstanding results." Is your team stuck in a rut? Are your people taking personal responsibility for achieving their work goals? ﻿Every organisation faces times when performance plateaus, when the work force is firmly within their comfort zone. At these times what is needed is a bit of a circuit breaker, something to knock the problems and challenges back into perspective, something to get people excited about how much more there is to achieve. This presentation confronts unspoken doubts head-on, and provides tips, tools and realistic strategies to help refocus team members on what they can control. It helps them build resilience, create momentum and achieve success. Win? Or Just take part? When I was preparing to row across the Atlantic I had an incident that illustrates the difference between simply turning up and taking part, and true high performance. So I thought for a moment and then said, ‘Okay, I’ll win’. 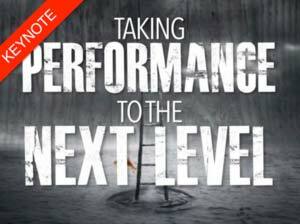 Increasing performance is not just about increasing effort. If that was all that was required to succeed or win at the Olympics, then there would be some nutcases training 26 hours a day. It’s about getting the right mindset and then developing a strategy that focuses on those areas where your effort is going to result in the greatest payoff. In Antarctica the extreme conditions and poor progress put the team under a lot of pressure. It was necessary to focus on and build on what was going right, rather than what was going wrong and carefully monitoring morale. The experience provided incredibly useful insights about how to keep performing, and keep a team functioning when the going gets really tough. Yet the key to getting through tough times is not being ‘hard’ it’s about being careful with what you are focused on. I share insights about perseverance and resilience from leading psychologist Martin Seligman. Your staff or delegates will leave this presentation with fresh tools and a new approach for taking on their challenges and lifting their game. "Thank you, Thank you, Thank you! Kevin, you made us laugh and you made us think! Your presentation at our staff meeting was inspirational and downright entertaining. You tailored your presentation to us so well in such a short timeframe and made it easy for us to take it to heart! Several people are already applying the 3 bastards rule - one is going to recommend it to their manager. The HR team got plenty of ideas to use in coaching managers and staff to focus on the goal and not drain energy. “Yeah/Nah” was completely relatable for everyone. I will be reminding several people in my own team from time to time and inviting them to keep me on my toes too. Just brilliant." Is your team finding it difficult to Cope with Change? Are they struggling to persevere through adversity? This presentation is about making your team more resilient to setbacks. It will provide them with tools to enable them to better persevere through difficult times and cope better with change. Nothing worthwhile is easy. In every role in every part of an organisation setbacks happen frequently - whether they come through external shocks, cyclical down- turns or through our own unintended, unexpected screw-ups. The Japanese have a wonderful saying ‘Fall down six times, get up seven.’ To keep going when the going gets tough is an essential skill. In many areas of life the single most important factor predicting success is mental toughness or ‘resilience’ - the ability to bounce back after shocks and setbacks and not dwell in unproductive emotions. For many people this is easier said than done. There is a tendency to internalise the reasons for a failure, generalise the failure to other areas and to believe that things won’t improve. While a minority of people are lucky enough to have a natural predisposition towards resilience, the good news for the rest of us is that there are skills and techniques that, if learned, can dramatically improve our mental toughness. FORMAT: Either an engaging and informing 60 minute overview, or a punchy, entertaining and interactive 2 hour workshop. CONTENT: Recovering from a setback is an emotional process. To influence that process we need to shift our understanding about how emotions work. We examine how the emotions you experience after a setback are a result of how you explain the setback. These explanations are always of 3 types - the 3 ‘P’s. Attendees become experts at recognising the 3 Ps in their own post setback thinking. Finally delegates are introduced to a series of questions that challenge unhelpful interpretations. Points are emphasised with anecdotes from The X- factor, The Matrix and high performance sport as well as my own experiences facing setbacks while preparing and taking part in the trans- Atlantic rowing race and trekking to the South Pole. The workshop concludes with a graduation test. Three examples of people responding positively to high stakes setbacks are given. Participants find that using their new skills they are able to perfectly predict how they react! How emotions ‘work’ and the emotional journey after experiencing a setback. The three ‘P’s technique to diagnose the explanations that cause emotions. How to dispute their patterns of thinking to minimise the impact of a setback and spend less time experiencing unproductive emotions. “I’d like to thank Kevin on behalf of the team at ALGIM for delivering a memorable experience for our delegates. Kevin was a pleasure to work with, and we look forward to dealing with him again in the future. Is your team under pressure to deliver exceptional results? Are they working below their full potential? Driving your organisation to greater success requires setting and achieving goals that currently seem ambitious. Unfortunately, it’s one thing to set an audacious goal - it’s another to get your team to emotionally invest in a target that seems beyond what they are currently capable of and make meaningful progress towards it. The tendency for people to stay inside their comfort zone is strong. When faced with a new challenge some will immediately find silent ‘reasons’ for not committing. You can attempt to encourage with external rewards and incentives but you know yourself that even with the best will in the world there is often a gap between wanting a result and doing something about achieving it. And when commitment is half hearted progress can be poor and motivation falters. This intensive half day workshop identifies and confronts the internal road blocks to achieving audacious goals. It provides participants with a set of tools and insights to help them remove their internal barriers to success and make a step change in performance. This workshop is about lifting performance. It gets participants to identify the mental ‘road-blocks’ to their success and replace them with empowering new attitudes and techniques. Through discussions, team and individual exercises, participants learn and practise the tools to be more effective, confident and resilient as they take on their challenges. If you have set some audacious challenge and progress is not as expected. This workshop starts from the position that motivated, capable and well-resourced people won't achieve at their potential if there are gaps in their skills or they have limiting attitudes and beliefs. The results are presented back to the team and then ‘antidotes’ are provided, discussed and then applied to their individual circumstance. The result is a bespoke solution, tightly coupled to your organisation’s objectives, and the individual's requirements. No role plays, no interpretative dance, just relevant information and focussed, highly interactive and inclusive exercises. A workbook is available for the cost of printing. Here is an example of the content from a recent workshop. - Do you have a Fixed Mindset? - The difference between ‘Outcomes’, ‘Goals; and ‘Processes’, and the role each plays in successful goal setting. - Avoiding the common trap of overestimating your skills. - Identifying ways to make your key tasks more enjoyable. - The ‘Pomodoro’, ‘Goop’ and other techniques for smashing procrastination. - Understanding that the fuel of motivation is making progress. - The four different ways to measure progress. Recently IAG were looking for a workshop to bring one of their new brand values of ‘Brave’ to life to key product development and underwriting staff. Participants were taken through a customised version of 'The Breakthrough Workshop'. In early 2016 Refresh Renovations were looking for an inspiring keynote followed by a highly practical goal setting workshop for 40 of their franchisees at their annual conference in the Gold Coast. The objective was to encourage them to set and achieve audacious goals for the year. Want to find out more? Let me do the work! Enter in your email address and I'll get back to you. Normally I respond in less than ten minutes. Together with his rowing partner Jamie Fitzgerald they became the first NZ team to trek unsupported and unresupplied to the South Pole. Most TV these days is Reality TV, and the latest trend is to take an occupation and turn it into a show. If you're a lifesaver you've got 'Piha Rescue'. If you're a vet you've got 'Vet Tales'. If you're a housewife you've got 'Real Housewives'. If you're single you've got 'The Bachelor', and if you think you've got talent you've got 'NZ's Got Talent'. Do you see the trend? They're coming for you next! In this action-packed presentation I prepare you, the audience, for your career in front of the camera by taking you behind the scenes of the filming of 'First Crossings' and 'Intrepid NZ' and sharing what I've learned. Did you think that TV used to be better back in the old days? Let's take a look at this clip from 1977. Just to be clear about how weird it is. This is two white guys (or maybe black guys?) dressed as black guys who are dressed as Mariachi's singing to a fake horse's head. The host of the show, Alan Funt, was a household name and instantly recognisable. In 1969, when the plane he was on was hijacked and flown to Cuba, the passengers on board were very anxious. Until someone recognised Alan Funt in the front row. Then they all started laughing. They were still laughing as they got off the plane in Havana! You'll learn how to come up with a format for your show and how much 'Man vs Wild' has in common to 'Dating Naked'. We'll fire up the Format-A-Tron and find a format and even a name for your new show. You'll find out about the three stakeholders that need to be satisfied before you can get your TV show off the ground, and how the inspiration for 'First Crossings' was in fact 'The Secret Life of Dancers'. Real life doesn't come along with cliff hangers every 22 minutes - but film crews expect to be paid anyway. So I'll explain how you sometimes need to give reality a helping hand - are you ready to play 'Real or Fake'? I'll talk about the hardest times in the shooting. When things got so difficult and dangerous we had to put the cameras away - Jamie's brush with death on the Buller river and going blind climbing Mt Aspiring. And the strange curse that seemed to follow our show from location to location. You might think that now you're on TV you'll be hanging out with Taylor Swift's posse and shooting hoops with Bieber. More likely is that you'll be in drag, under a gunge bucket putting on a lipstick for Sunday morning kids TV (I wish I was joking). Being a celebrity may not make you famous, but it does give you super powers. I'll show you how you can find out what the world actually thinks about you!